Happy Wednesday everyone and welcome to the Hearts and Angels Blog Hop! We would like to thank our wonderful sponsor, My Heart Stamps For You for the rubber stamps provided for us to work with. Our theme is all about using hearts and/or angels. As you hop from blog to blog keep in mind what you would make along this theme and when you are done checking out what the design team has to offer, come back here to submit your creation for a chance at a wonderful free prize of rubber stamps from our sponsor. Please remember, although we are using rubber stamps in our creations, you are welcome to use anything you would like....just follow the theme, and add it at the bottom of this post. For my submission I created this little book using my Zutter Book Binder. I used Copic markers to color my image and then added glitter from the ART Institute Glittering System. I plan on giving the book to my daughter-in-law to add pictures or journaling memories with my new grand-daughter, Brinnsen. Please view my video to see how I put it all together! You might find some fun giveaways along the hop..so be sure to read them through and follow the instructions. And please, please join us in our challenge here....there will be really fun prizes!! I am pleased to give you the line up for our fun little hop today. So without further ado...hop on over to Beth and see what she has to offer for you! This is great!!! and how sweet!!! 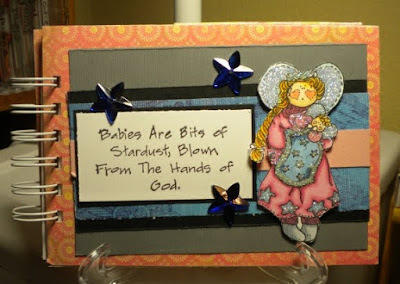 I love the comment on the stamp - babies are precious gifts from God. Thanks for sharing your awesome project. Thanks for sharing your wonderful angel with us. She is beautiful! Also thenks for the challenge, I love challenges . How exciting! I have to scrounge what I have and make SOMETHING! lol I really enjoyed your last blog hop.. so I know this one is going to be loads of fun as well! Super cute! Thanks for the idea of being able to glue extra pages together if you don't have chipboard. Great idea! This is super fabulous. Love the tutorial. All around adorable! Thanks Shelly for another great challenge, if you get a chance go over to my blog and read my post, I hope that my follower will check out the challenge! this is SUCH a brilliant idea! It is gorgeous!!!!!! What a great gift! Beautiful!